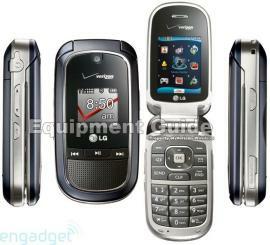 What makes a sneak preview of LG’s VX8360 so tantalizing? Compared to LG’s other bold and individual models such as LG Lotus and LG Dare, VX8360 is placed at a lower level or mid-tier status. Yet VX8360 features exciting features such as a 1.3 megapixel camera, VZ Navigator with A-GPS, EV-DO, access to Verizon’s broadband services including V Cast Video and V Cast Music as well as stereo Bluetooth. The feminine clamshell or rounded corners and diminutive size of the phone fit snugly into the palm. When flipped open, the phone has a graceful yet stylish interior. Despite its small size, it has an easily accessible keypad with music player controls that are bigger and easier to navigate than VX8350. Being both elegant and practical, VX8360 touted to retail at $50, is set to be snapped up at its debut.